Feel like an Australian for a day and play at G’Day Casino. This is the only place where the first deposit is double no matter how much money you deposit. In conjunction with reasonable wagering requirements, GDAY Casino is a godsend for highrollers and professionals. 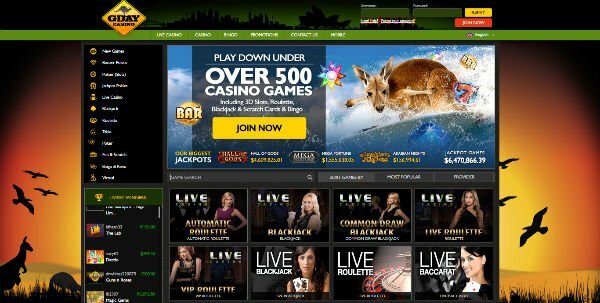 G'Day Casino was intended to cater for a fast-growing community of Australian players. The casino exceeded expectations and is now one of the preferred places to gamble for punters from all over the world. The recipe for success is simple and involves the concerted contribution of six major software developers. NetEnt, Betsoft, Leander Games, NextGen, NYX Gaming and Quickspin lent their talent and experience to deliver a one-of-a-kind collection of games. The Australian team is still dominant, with the website being populated by symbols that evoke the southern continent. Mobile gamblers will discover that the dedicated application is available in several languages and the same goes for the website. Owned and operated by the Imperium Network Solutions Limited, G’Day Online Casino is running under a license issued by the authorities in Curaçao. The price to pay is the exclusion of American customers, as a result of prohibitive legislation. G'Day Casino games are all state-of-the-art products and only the finest titles make the shortlist. The gambling operator can afford to be peculiar and focus on only the flagship games, because it works with six leading software developers. One of the unintended consequences of paying so much attention to the Australian market is that their slot machines go by the name of pokies. This is not even a nuisance, since the same popular titles can be played here, including progressive jackpot games. Quickspin and NetEnt are not only the main providers of games, but also the leading software developers when it comes to progressive slots. Players who perform a G'Day Casino download have the option of focusing on local jackpots or those pooled across the network. The level of competition differs but the same goes for the prizes, so this is a fair trade. Aliens, Jack and the Beanstalk, Zombie Rush, Dead or Alive, Starburst and A While on the Nile are some of the most popular games to be played here. The transition from slot machines to table games doesn’t require more than one click and video pokers are also present, albeit in smaller numbers around 20 different table games can be found here, with most focusing on different versions of roulette, blackjack and baccarat. Pai gow, pontoon and red dog appeal to those who are nostalgic about land-based casinos and can be played in instant format. Multihand Joker Poker, Split Way Royal, 3D Video Poker, Jacks or Better and Joker Wild are just a few of the 30 times of video pokers. The collection is completed by scratch card games, virtual and ball games, all fully compatible with mobile devices. Speaking of which, Starburst, Gonzos Quest, Blood Suckers and Foxin Wins sit at the top of the list of mobile friendly games. The live dealer section includes lottery games in addition to classic roulette, baccarat and blackjack. The G'Day Casino no deposit bonus is not supposed to make players rich overnight. It serves the purpose of raising awareness about the games available and also teaches players how to maximize the return on investment. Until new members feel comfortable gambling real currency, they can use play money on any of the games available. The live dealer games are the exception to the rule, so those who fancy interactions with real dealers, will need to make a financial commitment. G'Day Casino welcome bonus offers have changed, but the one currently available is arguably the best ever. In a nutshell, new members will be eligible for unlimited matched bonuses and players will have the first investment doubled regardless of the amount. When things sound too good to be true, they usually are, but in this particular case highrollers are living the dream. You can have any amount matched by 100%, just make sure you are capable of meeting the wagering requirements in time. Things only get better when you take a closer look at the introductory Gday Casino bonuses. Players will also receive 50% free spins after depositing for the first time and the second investment will once again be matched by 25%. Even the third attempt is lavishly rewarded with a bonus worth 50%, but these two deposits are capped at €500 or currency equivalent. Among the GDayCasino promotions, the one offering 50 free spins on the Guns 'n Roses slot is the most popular. It replicates the attractiveness of the 50 Free Spins No Deposit Bonus campaign and follows the same rules. The only shortcoming is that the resulting winnings are added to the bonus balance, so they need to be played through before cash outs are permitted. MasterCard, Neteller, Paysafe Card, Visa, Sofortuberwaisung, POLi, GiroPay, Skrill, dotpay, TrustPay, Local Bank Transfer are safe options for depositing and withdrawing funds. Those who make the transition from play money to real currency can deposit and gamble in EUR, USD, GBP, SEK, AUD, CAD, ZAR. A minimum deposit of €20 will suffice and players only need to increase the amount slightly to €30 when they make a cash out. Depending on the G'Day Online Casino payment option of choice, players will have to wait more or less for cash outs. Under normal circumstances, they can withdraw their winnings in less than 48 hours after verifying their identity. Those who have pending bonuses need to be extra careful to make sure the wagering requirements have been met before withdrawing funds. Otherwise, they are in danger of having the bonus forfeited and the resulting profits removed. Betsoft, Leander Games, NextGen, NYX Gaming, Quickspin and NetEnt are widely regarded as trustworthy software developers. Monitoring the same games twice for fairness is not excessive practice, but in complete accord with the industry standard. Once the software developers release a game, they vouch for the title and its random number generator. Independent auditors perform verifications of their own, so only GDay Casino games that are certified and tested are presented to the audience. Cyber criminals have a keen eye for stealing sensitive details and depleting the accounts of online gamblers. By having the casino registered with the FSA, G'Day Casino is compelled to uphold the highest security standards and use encryption technology. In addition to the license issued by the authorities in Curaçao, they also operate under a United Kingdom license. While casino representatives are probably frustrated by all these additional checks and balances, members have reasons to celebrate. New players are also advised to contact customer support is they need help with G'Daycasino bonus codes. Their specialists will advise them how to redeem these bonuses and how to convert them into cashable funds without missing the deadline. Assistance is delivered in multilingual format and all their professionals are fluent in the language they cover. gdaycasino.com has been around for just three years, but it already built a great reputation for itself. The decision to stick to the Australian decor paid off, by turning it into a hotspot for Aussies in the mood for gambling. The dual licenses issued by the authorities in Curaçao and United Kingdom enable the casino to cover dozens of countries from all over the globe. Over the last couple of years, the casino has improved its brand recognition and is very active across social networks. G DAY Casino occasionally offers free cash and free spins to those who like them on Facebook, where they also run a very popular raffle. Their promotions are not only generous, but also well advertised, so the odds of players missing out on great offers are slim to none. This is one of the few online casinos that don’t impose any limitations to first deposit bonuses. Aussies Players? Let us know how the casino stacks up against other AU casinos. - Friendly mobile casino covering all devices and operating systems. - The multitude of software providers allows the casino to be picky and add only the finest games. - Amazing welcome bonus, with players having any sum matched by 100%. - Customer support is outstanding, but unfortunately it’s not available 24/7 across all channels. - Instant play gaming is preferred by most players, but not all the games run on mobile gadgets.